Well, ladies, it’s wedding season so you know what that means- this day is all about YOU! You deserve to have the most special day that’s the most perfectest day you could ever imagine. After you read out Luscious List- 10 ways to tell your chunky bridesmaids to lose weight – you’ll want to hear this wedding story. Dorothy’s daughter Kate is visiting and gets lost finding the house because this is a historical fiction that takes place before google maps. Now, the first problem with Kate is that she has really dry bangs- she should really read our piece on how to make a homemade hair remedy out of amniotic fluid and tea bags – but the other problem is that she announces that she’s flying to the Bahamas to get married to a doctor! Ladies, this is what we call someone who is winning at life. All the time she’s spent on her own development has paid off- she is a kept woman. Dorothy can hardly contain her excitement- and insists that the gals throw Kate a wedding right at the house. Because what young woman wouldn’t want to be married in the Miami house of a singly old ladies? Well, get ready to do just that, and check our Pinterest page to learn how to make darling “old lady” wedding ornaments out of adult diapers and baby’s breath. But oh no! Kate wants Dorothy’s ex, Stanley, – her father – to come to the wedding also. [Be sure to read out feature on “How to Literally Seduce Your Father.”] Dorothy claims she’s going to kill him when she sees him, for she gave him “the best years of her thighs.” Note to self, that’s a good name for a line of pleather leggings. We learn that Dorothy was with him for thirty eight years, until he was on a business trip to Hawaii, the stewardess was told to give him a Lei, and she got confused. Stanley has a toupee that’s pretty bad. Let’s talk about WHO WORE IT BEST at Kate’s wedding. 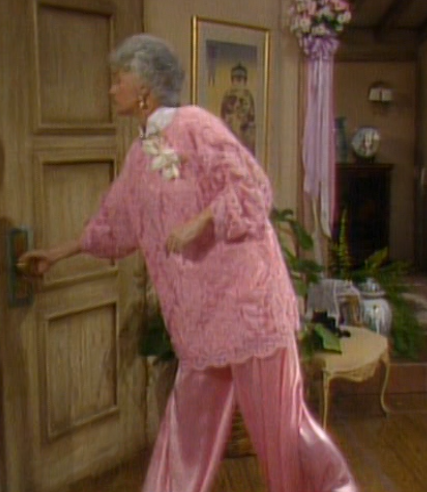 Dorothy wins the fashion prize this week in her stunning pink silk palazzo pants, oversized pink lace top, and white collared shirt. Work it! The “Oh, Rose” moment: Rose is upset that Sophia keeps eating her cheeseballs. Please note: the cheeseballs appear to be green.